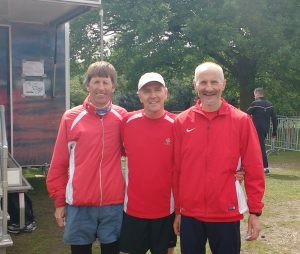 The club sent 2 teams down to Sutton Coldfield for the annual British Vets Road relays in Birmingham, a 6-man M35 team and a 3-man M55 team. With the M35 team depleted due to injuries and Stirling marathon debuts, we were indebted to Paul Kernohan for stepping in as a late call up, knowing that last year’s silver medal performance was not on the cards, whilst our M55 team were in better shape following a recent Strathclyde Parkrun trial and hoped to get close to last year’s 4th place finish. With great commitment from the 9-man squad to get time off their work so that we could travel on Friday afternoon, and despite having to divert off the M6 following an accident, everyone arrived at the Travelodge in good spirits and in plenty of time to enjoy a team dinner at the local hostelry. The banter in the cars and pub was up to and exceeding the usual high standards, some cracking stories, some crap jokes and some “not to be repeated” tales! With the sun shining brightly early on Saturday morning as we walked to order breakfast, Alick Walkinshaw confidently predicted a rain free day to accompany our athletes, despite the gloomy weather forecast. Full English, porridge, pancakes, toast and scrambled egg were quickly dispatched and washed down with tea or coffee, race day was well underway, and that was only Mick O’Hagan’s breakfast!. The first race of the day was the Ladies race at 10:30am, and whilst we are hoping to enter our first ladies team next year, this year our interest was in Jacqueline Etherington, representing her English club Sunderland Harriers, and she had an excellent run in the 1st leg coming home in 5th place and 9th fastest W35 of the day as her team eventually finished in 5th place. Club athletes Archie Jenkins (match referee & starter) and Lynne Marr (changeover steward) were extremely busy ensuring the races ran smoothly once again, but they still took time to pass on a word of encouragement and to thank us for being the furthest travelled and only Scottish club in attendance this year. Next up was the M55/M65 race at 12:15pm. On paper, last year’s winners South London Harriers were even stronger this year, as were Herne Hill and Barnet & District, and with usual rivals Sheffield, Tonbridge and Salford in attendance amongst the 44 entries, a good start would help. 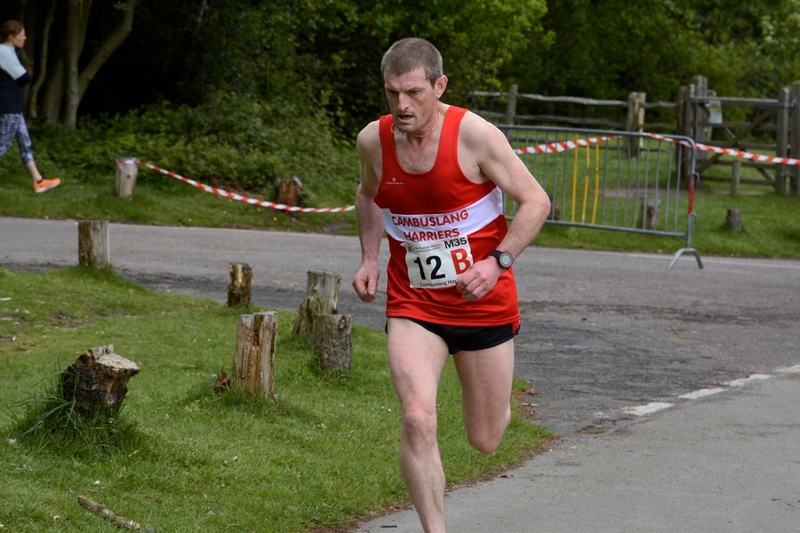 Colin Feechan was put out on the 1st leg and whilst Bingley Harriers and Harrow AC athletes broke away early, Colin started steadily within the pack and worked his way through to 4th place until the last 100m to finish just behind Sheffield in 17:58, with South London ahead in 3rd place. Next out was Paul Thompson who proceeded to close the gap on leaders Harrow AC and South London, and caught and passed Bingley Harriers. 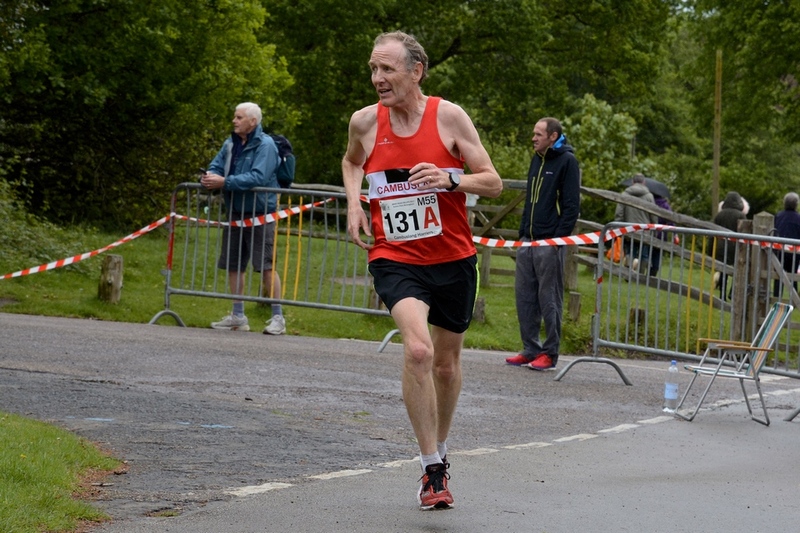 Despite being our oldest club athlete in attendance, Paul Thompson ran our fastest time of the day with 17:46, showing why he currently holds a number of World Masters half marathon and 5,000m titles. 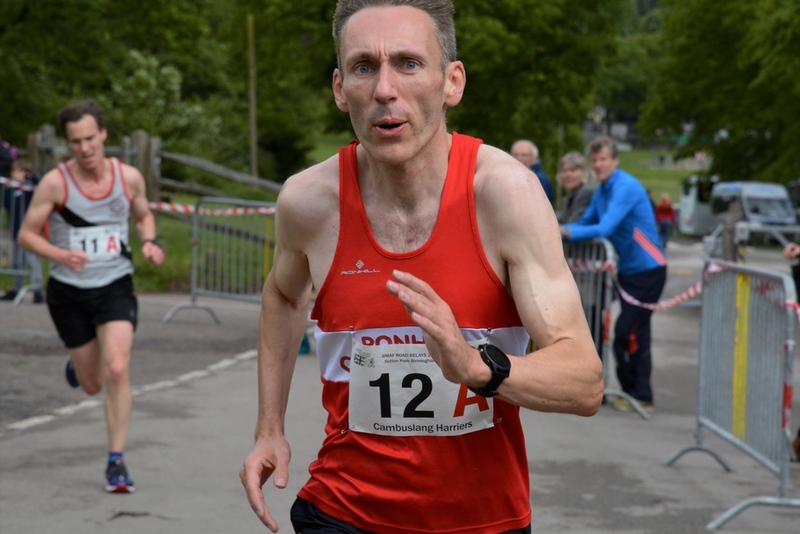 Despite being caught in the last 20m by Tonbridge Harriers, he handed over to Alick Walkinshaw in 4th place only 1 second outside the medal positions, with the leaders Harrow AC 35 seconds ahead. 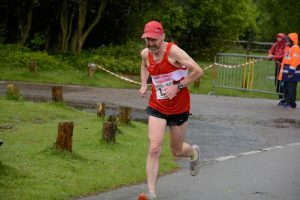 This was a new challenge for Alick as last leg runner, but he immediately moved into the medal positions as he attacked the first hill. 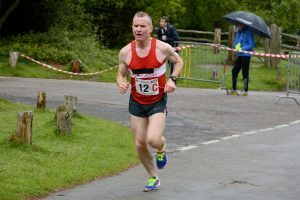 South London’s Andy Tindall proceeded to run the fastest time of the day and South London were clear winners retaining their title. Alick however was not content with 3rd place and had moved into 2nd place just before the turn as Harrow’s challenge faltered. Alick gave everything for the cause and brought the club home in silver medal position with a time of 17:50, a full 50 seconds ahead of Tonbridge in 3rd, with Sheffield rallying to finish in 4th place. All in all, this was a very pleasing performance from a well-balanced and fully committed team. The last race of the day was the M35/M45 race at 2:00pm. 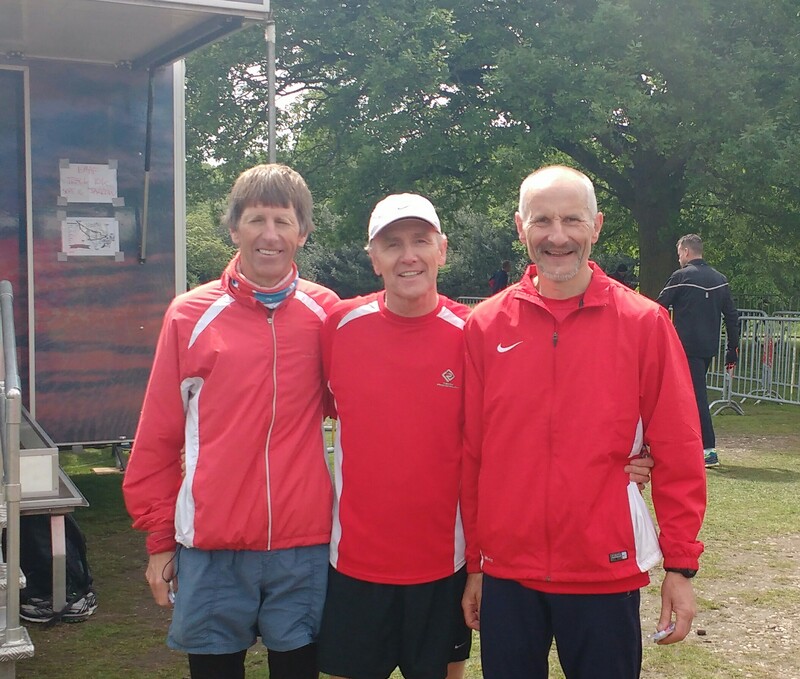 With 50 M35 teams entered, our mixed age group team was targeting a top 25 finish. Paul Kernohan went off first and can be pleased with a time of 18:13 on his debut on this tough course, coming home in 32nd place. Mick O’Hagan was on leg 2, and despite calf problems interrupting his training for the last month, he produced our fastest time with 17:51 taking the team up to 29th. Next out was Scott Hunter, who is steadily returning to his form of a few years ago which saw him pick up Scottish team medals, and a time of 18:17 brought us up another place to 28th position. 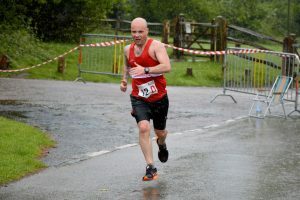 Simon Gold was on leg 4, and was under 10 minutes in to his run when the heavens opened, almost turning part of the course in to a mini river. 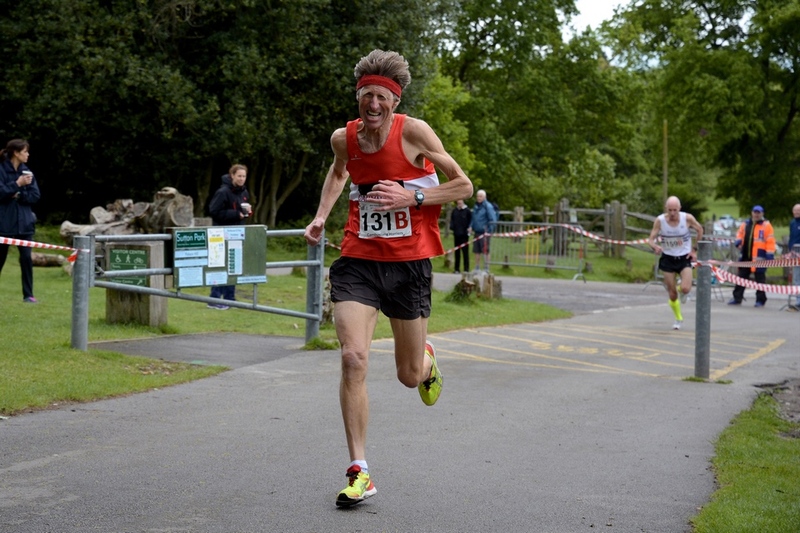 This did nothing to deter Simon, who proceeded to move the team up another two places to 26th as he recorded 18:22. 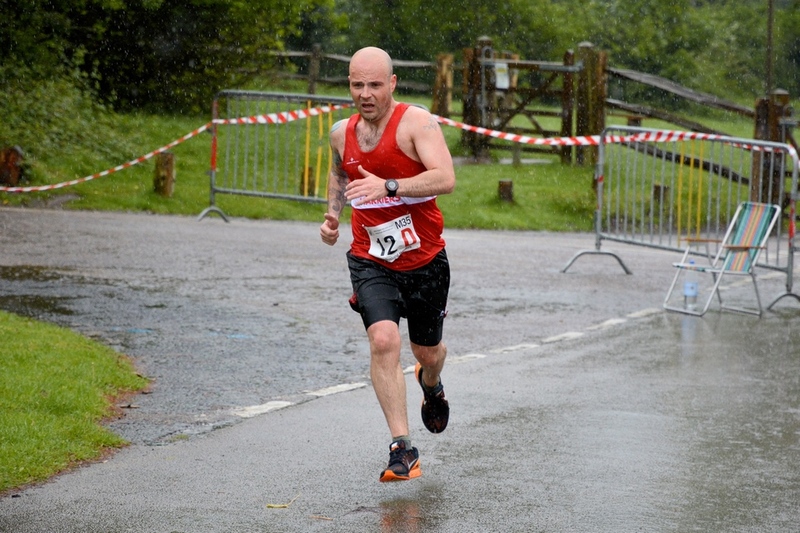 Dave Thom was looking like a drowned rat before he started, and “enjoyed” the worst of the weather as a mini monsoon ensued, dropping only 1 place as we dropped to 27th place. However, he received little sympathy from his team mates as he had volunteered to run leg 5 beforehand. 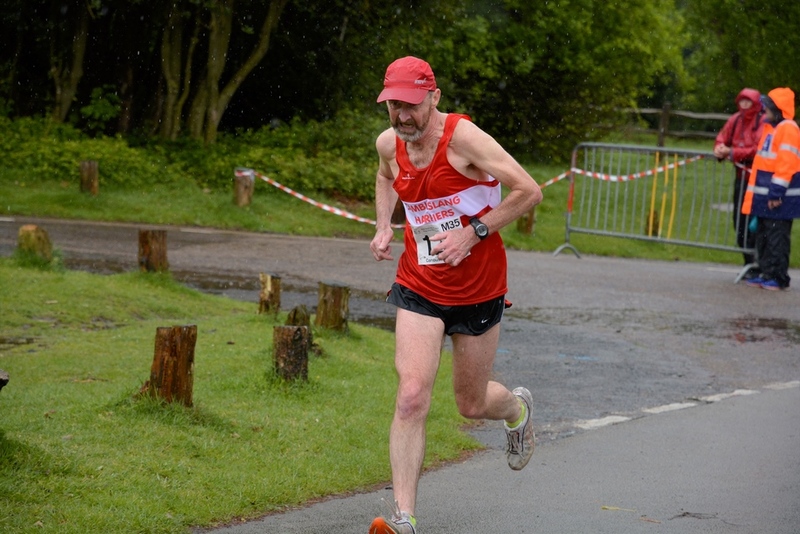 Special mention must be made for the commitment of our last leg runner and driver Tony McCutheon. 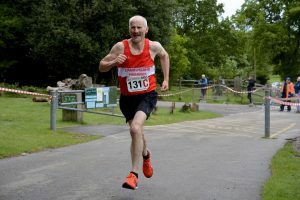 A visit to the podiatrist on Thursday confirmed a bad infection to a foot blister and he was advised not to compete, but Tony made special efforts to start a course of antibiotics on Thursday evening, hoping that it would provide extra time to take effect. Tony was placed on the last leg to allow for extra recovery after declaring himself fit, and he was rewarded for his positive approach with a time of 18:13 as he took 4 places on his way to lifting the team into the top half of the field of 50 entries as we finished in 23rd place overall, 2 ahead of our target position. The camaraderie of the team was excellent throughout the weekend and this was evident as they gave great commitment during their individual legs. Two of our Anglos were competing for their English-based clubs and GB marathon internationalist Martin Williams recorded the fastest overall time of the day on leg 1 with a superb time of 15:11 as his English club Tipton Harriers eventually finished 2nd M35 team. 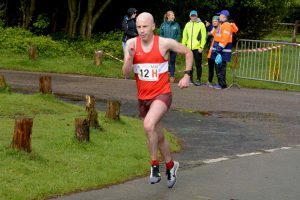 Kenny MacPherson was competing for Tyne Bridge Harriers in the M45 race and a time of 16:58 contributed to his team picking up the bronze medals. On the way home, we all met up at Westmoreland Services for the final thoughts on the weekend, and it was noted that nobody approached Alick to ask him to predict the winning Lottery numbers! A great weekend was enjoyed once again by all attendees at this blue ribbon vets championship with a number of English athletes taking the time to ask us “where is Cambuslang?”, as once again we make a positive contribution to this event.